Although individually tiny, it is as if these coprophilous disc fungi find safety in numbers - often they swarm over dung in their hundreds or sometimes even in their thousands. 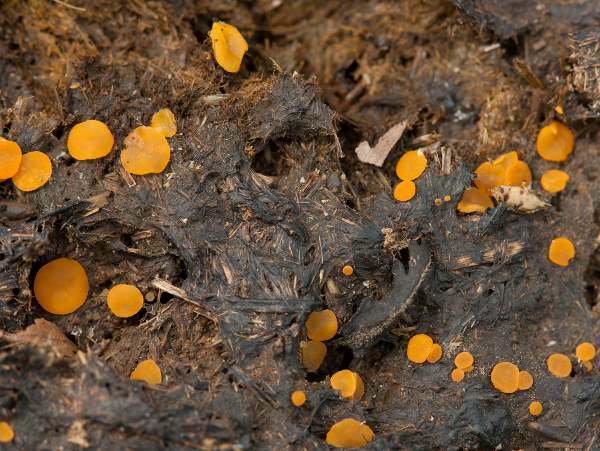 This colourful ascomycete is a very common sight on animal dung throughout Britain and Ireland as well as in all other European countries. 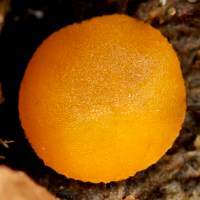 Originally described as Peziza granulata by Jean Baptiste Francois (Pierre) Bulliard in 1790, this species was transferred top the genus Cheilymenia in 1990 by the Czech mycologist Jiří Moravec (born 1943). Synonyms of Cheilymenia granulata include Peziza granulata Bull., Ascobolus granulatus (Bull.) Fuckel, Ascophanus granulatus (Bull.) Speg., and Coprobia granulata (Bull.) Boud. 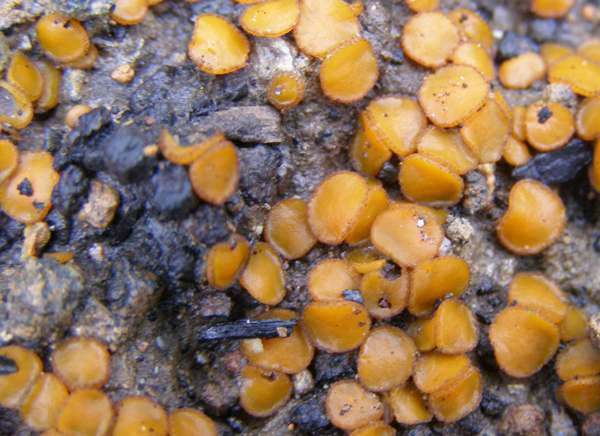 The specific epithet granulata means covered in granules, as if you look closely you will see that the fertile surface of these little fungi are. The key to identifying to species level the various species of Cheilymenia and Scutellinia (the other main group of eyelash-fringed disc fungi) of which there are close on 50 known in Britain and Ireland, is by microscopic examination of asci, spores and any hairs or 'lashes' that cover the infertile surface. 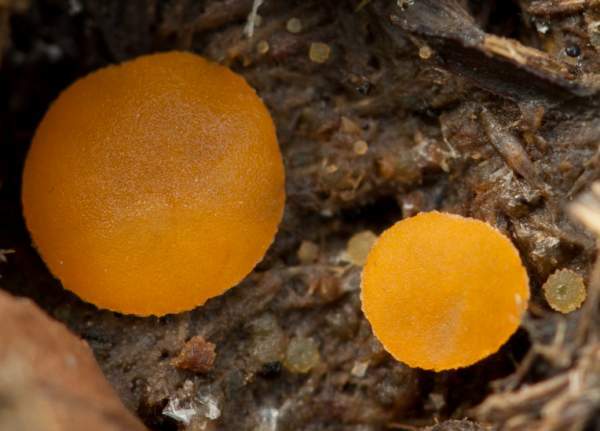 Flat or shallowly concave discs, 1 to 2mm across and 0.5 to 1.5mm tall; orange; sessile; usually in groups and sometimes in huge swarms on cow-pats. The fertile (upper) surface is bright orange, smooth in the centre but granular near the rim. 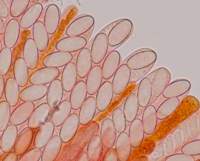 150-220 x 10-15µm, with eight spores per ascus. Reportedly not distinctive - although who would want to try tasting such offerings? Saprobic, on all kinds of herbivore dung, but especially cow-pats. May to early November in Britain and Ireland. Several other ascomycetous disc fungi also colonise animal dung. Few can be identified from macroscopic features alone, and so microscopic examination of asci, spores and other cell structures is usually necessary.